In the year 1023, a young man named Andi Co sailed alone to an isolated island at the top of the world. On this small island, he found a mass of land covered by snow. There was no evidence of any animal or plant. The snow was white, flat, and pristine, and the sun was bright and high above his head. Upon stepping onto the snow, he noticed a small structure protruding from the land in the distance. Andi hiked towards the structure to still find no evidence of any other being. As he approached the small building, he saw a maroon door laced with blue outlines of several circles. He opened the door and entered the room. Inside the dark single room lit only by sunlight pouring in from the open door, the temperature was so warm that Andi could remove his coat. As he began removing his coat, the temperature began to rise so quickly that he removed all his clothing and was standing naked. As he turned to close the door behind him, he noticed that his footprints in the snow had disappeared. After closing the door, he stepped over his pile of clothes and walked forward. He stood still and let his eyes adjust to the darkness. After nearly an hour of standing completely still, Andi’s eyes never adjusted. At the moment he consciously thought about stepping backwards and redressing, a small white light appeared in the middle of the room. Andi looked around to see the source of light, perhaps a crack in a wall or the roof, but there was nothing. He stood still for nearly another hour, looking into the small source of light until he decided to step towards it. The light began to flicker and when he stepped within arms reach, he raised his hand to inspect it. Before he could touch the light, it slowly transformed into a small flicker of flame. There was no candle burning beneath it—simply a flame suspended before his eyes. Andi put his hand down and looked around the room. To his left, there was a wall—bare and flat. To his right, there was a glistening wall, bare as well, but completely covered with liquid. He squinted hard to focus on the moisture, but could not comprehend what it was. Ahead of him, beyond the flame, was another wall. As he squinted to focus on the wall he noticed several more drawings like the circles on the door. Before he could clearly see any shapes, the flame began to grow. It grew and grew until it was the size of his head. Because Andi could not discern the heat from the flame and the heat within the room, he did not move from his position. The flame continued to grow so large that it now touched the floor and ceiling and brushed against his body. At this moment, Andi extended his arms into the flame and was met with a sudden silence—a silence of sound, a silence of thought, and a silence of life. It was at this moment that Andi entered nirvana. The structure and meanings of the Society of 23 remain deeply hidden. Some say that when Andi returned from his spiritual state, he was given a small book written by the teachers he had encountered during his journey. Others say that when he returned home, he shared his story with his brother, Song, and they documented the experience together. To this day, the most popular belief still remains that Andi, returning to reality from his transfixed state, manically scribbled into his journal for days in the small room without any light. Regardless of the story, the secrets of the Society of 23 are contained in that book, known today as the Andico. For hundreds of years, the Andico has been passed from one generation to the next. The Society of 23 continues to tap individuals to share the secrets of the Andico, brotherhood, and nirvana. Through solitary and ritualistic practices, the member of the Society of 23 can maintain the necessary skills to lead a life of perfection. The brotherhood places a great emphasis on symbolism. The original meanings of the symbols are secret, known only to the brothers of the Society of 23. Several members of the Society of 23 have become seminal gatekeepers of culture and society throughout history, intentionally sharing various representations of the sacred symbols. To that end, it can be assured that exact symbolic meaning, as described in the Andico, has never left the secrecy of the Society of 23. In order to identify the Society of 23, a coat of arms was created in 1124. Since then, there have been several modifications to the original coat of arms. The current coat of arms was produced in 2008, slightly modifying the previous version created in 1983. 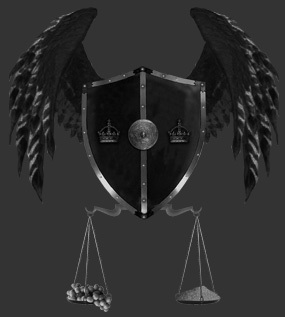 The coat of arms reveals a non-traditional element of a winged-shield defying gravity. The shield is decorated with two royal crowns on either side of a centered metallic circle. Supported at the bottom of the shield are two scales carrying equal weights of grapes and grains of rice.